The Progress-Focused Approach: Do you use the end-of session break in your conversations with clients? Do you use the end-of session break in your conversations with clients? In my LinkedIn group I asked the following question: as a solution-focused therapist, do you use the end-of session break in your conversations with clients? The end-of-session break was a standard part of the solution-focused approach to solution-focused brief therapy as it was developed by the Brief Family Therapy Center (more about the origin of the solution-focused approach here, here, here, and here). 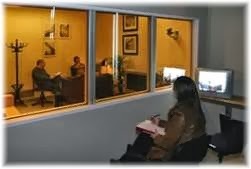 During the break, the therapist would reflect on what had been said in the conversation and/or discuss this with colleagues who had watched the conversation from behind a one-way screen. After the break, the therapist would come back and first give a series of compliments about what clients had done that worked and then a few suggestions which were based on what clients had said. My impression was that this practice has changed. I suspect that many SF therapists don't use breaks at all anymore, and that those who do usually don't use a reflecting team anymore. My question: Is this true? Do you still use breaks? What are your reasons for using it or not using it? These responses suggest to me that not many people use reflecting teams anymore (who sit behind the one-way screen, that is), that the break itself is still used, but not by everyone, and that the message after the break has become a bit different. I'd be interested to get more responses. while I do not lead therapy session using SF ... when working with clients in a coaching and team development and group setting. I like for all of us to take a 10 minute break somewhere in the last hour of time. During this break I ask the people to take a walk, relax, do what works for them. I take the time to attempt to chart what is working well and a possible task assignment (hopefully a skeleton key) that the team and / or the individual can try. When we all return I thank the people for returning and tell them what I admire about the team and people. Then I ask them for what they found useful and admirable about our time. Then I usually ask them to complete something, a task assignment. If this what you would call an end of session break? I still use the end of session break in counselling. Offcourse its selfreflection. During the break I ask the client to complete the SRS. I reflect on what has been said, on the exceptions, on what could be or are seeds of progress and on process complimens that I can give to the client to elicit, amplify and reinforce progress already made. I also formulate a question and/or suggestion to the client on what the next small step could be to make further progress. Hi Stanus, thank you. I like that you emphasize what kind of compliments you use :). By the way, what are your experiences with the SRS?